Benzodiazepines is a class of psychoactive drugs that are used to treat anxiety, insomnia, panic disorder, seizures, and alcohol withdrawal. These drug produce a calming effect by enhancing the effect of the neurotransmitter GABA. Benzodiazepines are widely prescribed drugs across the world. They are helpful to reduce anxiety, seizures, relax muscles, inducing sleep, and used for sedation purposes prior to surgery or general anesthesia. The global benzodiazepine drugs market was valued at around US $ 2,055 Mn in 2017. It is expected to expand at a CAGR of 2.7% from 2018 to 2026. The Alprazolam segment dominates the global market in terms of value. The market for benzodiazepine drugs is expanding significantly due to the rise in prevalence of anxiety, seizures, insomnia, and increase in concern among people about preventive measures regarding stress-related conditions. Increased adoption of generic drugs and comparatively higher prescriptions for benzodiazepines, as compared to other psychoactive drugs, also drive the market. The benzodiazepine drugs market has been segmented based on product, application, time of action, distribution channel, and region. Based on product, the global market has been divided into Alprazolam, Clonazepam, Diazepam, Lorazepam, and others. The Alprazolam segment dominated the global market in 2017. It is projected to expand at a higher CAGR due to more number of prescriptions and wide applications in anxiety and seizures. Based on application, the global benzodiazepine drugs market has been classified into anxiety, insomnia, alcohol withdrawal, seizures, and others. Anxiety was the dominant segment of the market in 2017. It is expected to expand at a higher CAGR, owing to the rise in prevalence of anxiety and panic disorders and the better calming effect produced by benzodiazepines. In terms of time of action, the global benzodiazepine drugs market has been classified into ultra-short acting, short acting, and long acting. The short acting segment dominated the market in 2017. It is expected to maintain its position due to less hangover effect and faster onset of action. Based on distribution channel, the global benzodiazepine drugs market has been segregated into hospital pharmacies, retail pharmacies, and others. The others segment, which comprises online pharmacies and mail pharmacies, is projected to expand at a significantly higher CAGR during the forecast period. This expanded CAGR is attributed to discounted prices and convenience of usage. In terms of region, the global benzodiazepine drugs market has been segmented into North America, Europe, Asia Pacific, Latin America and Middle East & Africa. North America dominated the global benzodiazepine drugs market in 2017, owing to the rise in prevalence of anxiety and related conditions and higher FDA approvals of benzodiazepine drugs by major players in the region. 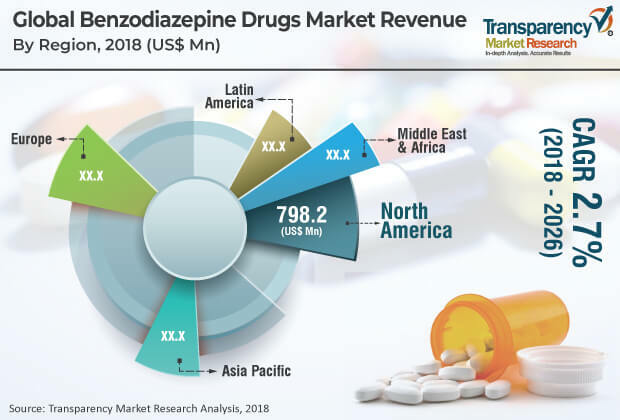 Asia Pacific and Latin America are potential markets for benzodiazepine drugs due to increased awareness of people toward healthcare, stress conditions, and surge in healthcare expenditure. Key players operating in the global benzodiazepine drugs market include Pfizer Inc., F.Hoffmann-La Roche Ltd., Bausch Health Companies, Inc., Mylan, N.V., Teva Pharmaceutical Industries Ltd., H.Lundbeck A/S, Amneal Pharmaceuticals LLC, Sun Pharmaceutical Industries Ltd., Apotex Inc., and Aurobindo Pharma.